Have you ever wondered what Santa likes to do when he's not busy making toys? 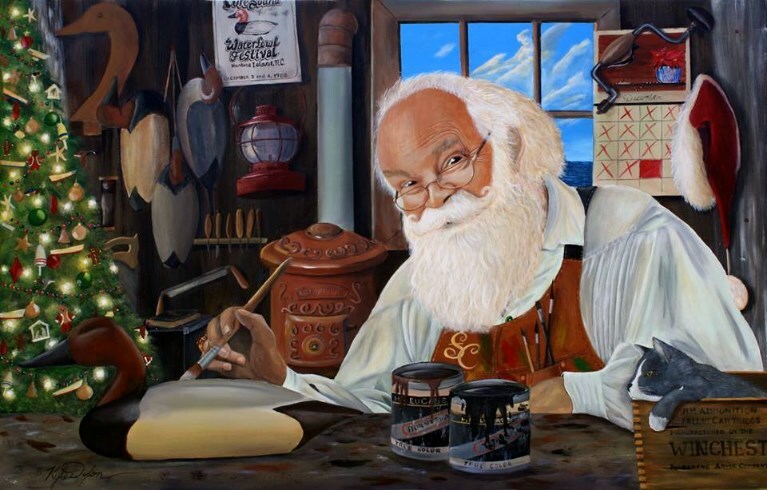 Artist Kyle Dixon from the coast of North Carolina thinks that Santa is a decoy maker. Kyle's work has been featured at the Core Sound Decoy Festival in Harker's Island, NC, which is held every December. I was pleased that Kyle asked if I would be his model for this year's festival painting. Now, I have prints available for sale on my website, but hurry, there will only be 150 signed-and-numbered prints available in the edition. The image size of the reproduction is 8 1/2" x 13" with ample 2" borders and is printed on heavy art cover stock. The price for the reproduction is $30.00 plus shipping and tax for my North Carolina friends.